Duke Realty has pic ked Dolce Living to develop two new, six-story buildings with a total of 400 apartments at the West End mixed-use development in St. Louis Park. I reported earlier this month that Duke was pursuing partners to help it develop part of the site at the intersection of Highway 100 and Interstate 394 on the border of St. Louis Park and Golden Valley. It’s also trying to find a buyer for the lifestyle shopping center and entertainment complex known as the Shops at West End. Indianapolis-based Duke is in the process of forming a strategic partnership with Hallendale Beach, Fla.-based Dolce. The companies want to create an urban village and still develop office space on the undeveloped portion of the site, according to a memo to the St. Louis Park City Council from Greg Hunt, the city’s economic development coordinator. 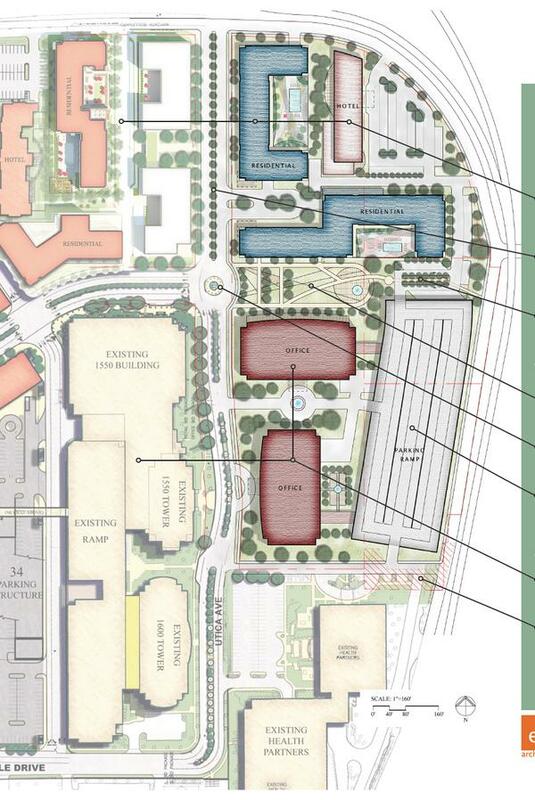 The new apartment buildings would be on the northern portion of vacant land owned by Duke. Dolce is already building the Millennium at West End Apartments that are under construction on a nearby site overlooking Interstate 394. It paid Duke $4.85 million last year for the 3.5-acre site where its building the Millennium project. Dolce razed a Chili’s restaurant building for phase one and still owns the Olive Garden, but eventually plans to redevelop that part of the site as well. Duke also plans to find someone to develop a six-story, limited services hotel with between 150 and 200 rooms. Duke hasn’t named a hotel partner yet. Duke was supposed to begin construction of 1.1 million square feet of office space on the vacant land before July as part of its original development agreement with the city of St. Louis Park, signed in 2009. Duke has returned to the city with a request to modify its development plan to have less office space but include the apartments and hotel. It now envisions between 578,000 and 700,000 square feet of office space in two towers. It’s also planning a parking ramp and “linear green space” for pedestrian and bicycle connections through the middle of the site. The St. Louis Park City Council discussed Duke’s revised concept plan at a special study session Monday night and decided to work with Duke and Dolce Living on an updated development agreement, Hunt said.